Insulin 'Pill' Could Replace A Shot Someday, Researchers Say : Shots - Health News A lot of vaccines and some medications need to be delivered by injection. 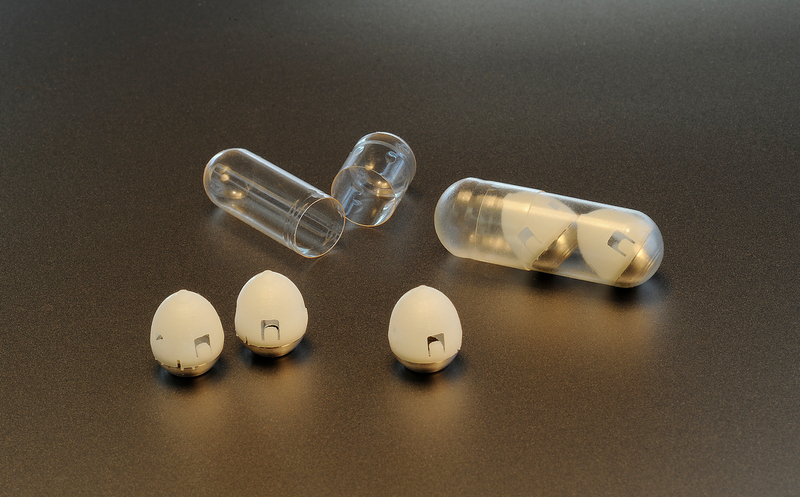 Two groups of researchers are designing ways of delivering these medications by putting them in pill form. 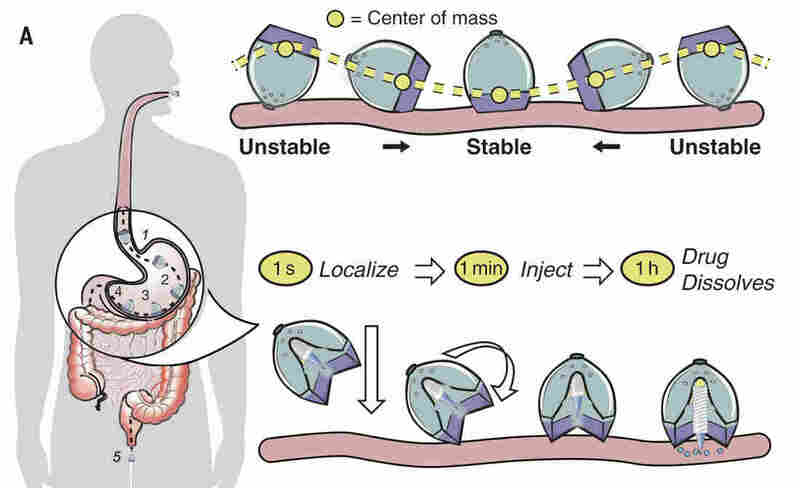 A team of researchers in Boston has developed an insulin-delivery system that injects the medicine directly into the stomach wall, which is painless. Many vaccines and some medicines, such as insulin, have to be delivered by injection. That's a pain, both for patients and for health care providers. But two groups of researchers are trying to put some of these medications in pill form to avoid the needle. One team of scientists, from MIT's Koch Institute for Integrative Cancer Research and Harvard's Brigham and Women's Hospital, developed a system to deliver insulin that actually still uses a needle — but is so small you can swallow it and the injection doesn't hurt. They built a pea-size device containing a spring that ejects a tiny dart of solid insulin into the wall of the stomach, says gastroenterologist Carlo Giovanni Traverso, an associate physician at Brigham and Women's Hospital. "We chose the stomach as the site of delivery because we recognized that the stomach is a thick and robust part of the GI tract," Traverso says. So far so good, but Traverso says there was a problem the team had to overcome: "How do we get these devices to self-orient such that the end that is doing the injecting part is in direct contact with a tissue?" "Leopard tortoises happened to have evolved a way of doing this," Traverso says. The shape of the tortoise shell helps the turtle flip over if it happens to wind up on its back. And there was another source of inspiration: Weebles, those egg-shape toys that wobble but don't fall down. 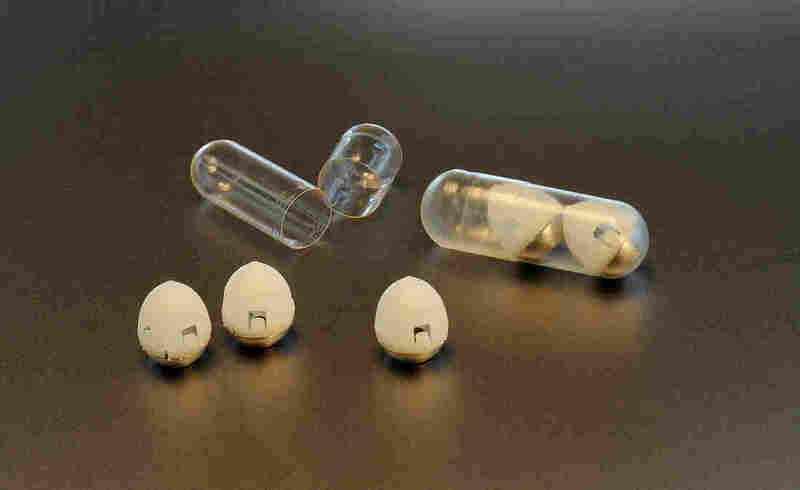 The self-righting capsule orients itself inside the stomach and ejects a tiny dart of solid insulin that's about a quarter of an inch long. As the researchers report in the journal Science, they've tested the device on pigs, and it can deliver a therapeutic dose of insulin provided the pig has an empty stomach. "It actually propels [itself] using bubbles in a reaction of magnesium with biological fluids," Fang says. Much like Traverso's design was inspired by the shape of a tortoise shell, the bubble-propelled microrocket travels like a bacterium. "If you had bacteria invade your gut, they're not just going to be sitting around statically, they're going to be swimming around, and they're going to make it to the intestinal wall," Fang says. As Fang and his colleagues report in Nano Letters, their delivery system works in mice, but human testing is probably many years off.